London 1891 solid silver gilt and cut glass spirit flask. 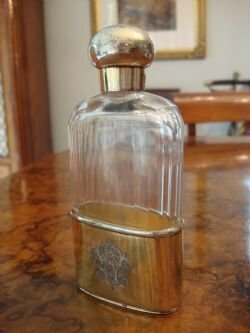 Very attractive and striking London 1891 English hallmarked solid silver gilt spirit flask with screw thread cork lined top and detachable silver drinking cup. 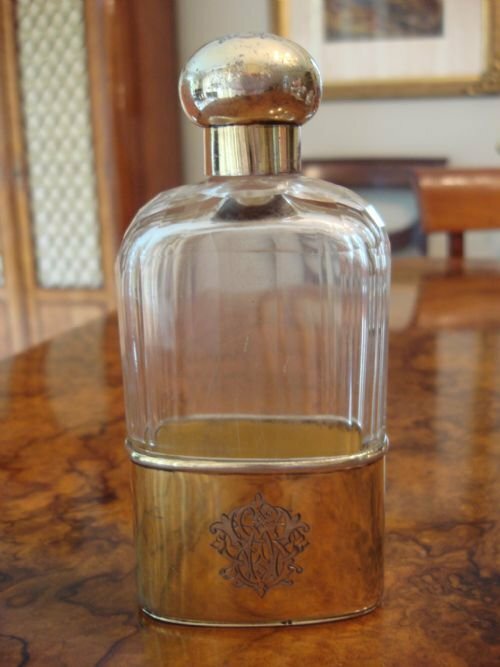 This lovely flask has a panel cut glass body with facet cut shoulders. The top is solid silver gilt, as is the heavy gauged removable drinking cup base. Both silver pieces have very nicely and ornately engraved initials, and both are identically hallmarked. The silver maker is Norman Marshall. Size-6.25 inches high by 2.75 inches wide by 1.25 inches deep. Weight-395 grams total, 100 grams silver only. 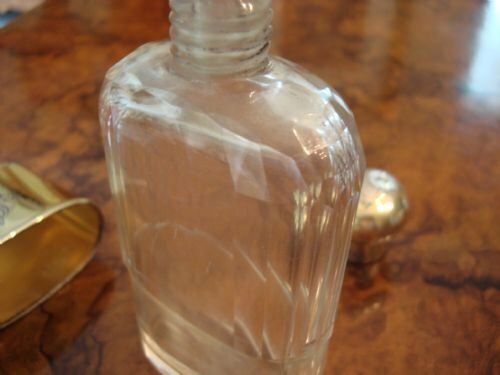 There is some slight nibbling just at the side corners of the glass body where it meets the cup, some handling wear to the silver gilt, and a tiny bump to the lid top. A lovely piece to use or display, and a great piece for the collector, and those who shoot, fish, and enjoy outdoor pursuits. Sheffield 1908 solid silver heavy spoon of shooting interest. Sheffield 1908 English hallmarked solid silver heavy spoon of shooting interest, with crest to stem, and inscription to bowl. Made by Joseph Rodgers and Sons. A nice spoon in very good condition. Birmingham 1912 rare solid silver footed collapsible travelling pocket beaker with original case by GEORGE UNITE, famous and collectable maker. 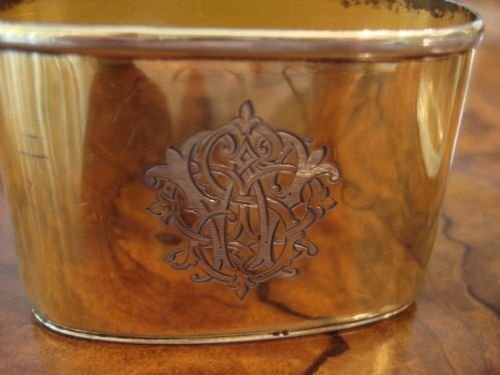 Birmingham 1912 rare English hallmarked solid silver footed collapsible travelling beaker including the original hard silk lined case and cover, which is normally lost over time. This makes it completely original as when first sold. It is a fine example of Edwardian craftsmanship, ingenuity and utility. Taller than travelling beakers usually found, this is a six section beaker by the very famous and highly collectable maker George Unite. It has a banded top, stable footed base, and the original gilt lining. Used by the well to do gentleman when travelling or hunting, this telescopes down to a small size, carried in its slim case, and is perfect as a pocket cup. When pulled up taut to full size, it provides a watertight beaker for drinking, while on the move. Size-3.6 inches high by 2.5 inches diameter by 2.6 inches diameter base. Closed-1 inch high. With very clear hallmarks, excellent weight, and in very good condition, this is a rare collectable, with a very practical use for travelling or outdoor pursuits. 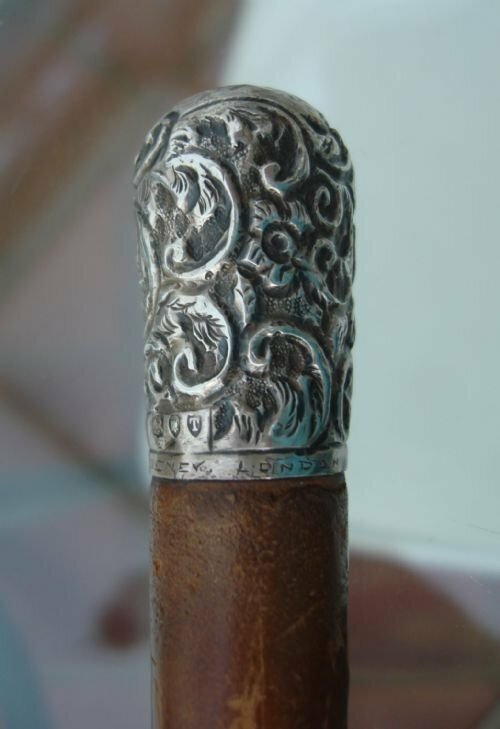 A great gift for a gentleman perhaps, or a wonderful addition to a novelty silver collection. 19th century Victorian Swaine Adeney leather hunting saddle canteen with original contents. Swaine Adeney Victorian complete leather hunting saddle canteen lined with doeskin, and having an internal partition dividing the contents. 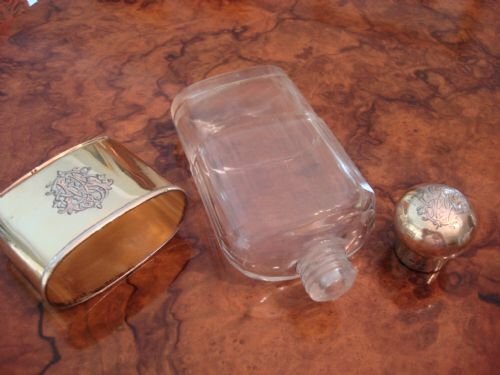 The contents include the original silver plate bayonet topped rectangular glass spirit flask, as well as the original double hinged silver plate sandwich case with pull ring. These canteens were attached to the side of the saddle and used during hunting pursuits. Swaine Adeney is a very well known luxury maker of leather and equestrian goods, still in business for the last 250 years, and warranted by the Royal Family. The mahogany coloured leather case has a lovely patina, and is lined with tan doeskin, has the original straps and buckles and D ring to side. The flask has the makers mark of John Dixon and Sons, while the sandwich box bears the Swaine Adeney stamp. The flask is in very good condition, as is the sandwich case apart from some corrosion on part of the exterior back mainly. The flask has been tested, and it is absolutely watertight. It holds about 140 ml of liquid. Size-5.75 inches by 5.5 inches by 1.75 inches deep (not including straps). Size of sandwich box is 4 5/8 inches long by 3 1/8 inches wide by 1.25 inches deep . Size of flask is a generous 4 7/8 inches long including cap, (4 inches high without cap) by 2 inches wide by 1.5 inches deep. A lovely and interesting item appealing to antique leather, equestrian and hunting enthusiasts. In overall very good condition. 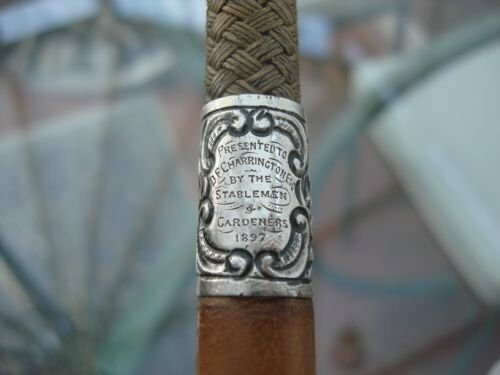 London 1894 lovely solid silver and leather gentleman's whip by Swaine Adeney, world famous whip makers, and holders of the Royal Warrant. 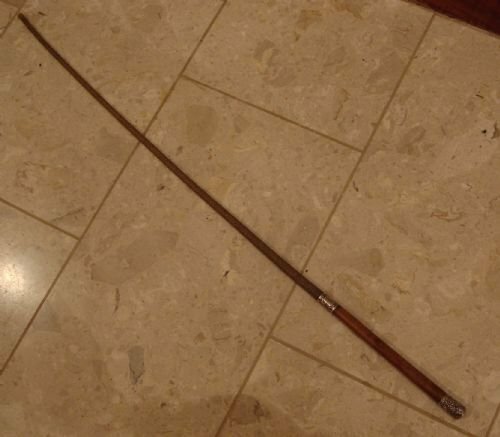 London 1894 Victorian English hallmarked solid silver mounted leather gentleman's whip by famous makers Swaine Adeney of London, in business since 1750, and whip makers to the Royal Family since the reign of George III. Made with repousse designed solid silver top and collar, with leather hand shaped handle, and whale bone whip core, covered by braided whalebone, horsehair or catgut. The collar is engraved "to D.F. Charrington, Esq., by the stablemen and gardeners, 1897." This would have been a very expensive purchase at that time, so Mr Charrington would have been a member of the gentry and held in the highest regard. Swaine Adeney have been the finest traditional whip makers in England since Georgian times, and are still making whips by hand in their workshops. They continue to hold the Royal Warrant by appointment to the Royal Family, a prestigious mark of recognition, and make the finest available equipment for hunting and riding. Size-35.5 inches long by 7/8 inches wide. This is a really lovely item of interest to those with equestrian interests, collectors, or designers. It would make a great piece to display in a gentleman's library or den. London 1912 solid silver topped cut glass pair of spirit flasks in crescent shape, in fitted case by Finnigans of Bond Street. London 1912 English hallmarked solid silver and cut glass spirit flasks in crescent shaped curved bottles, mounted in bespoke fitted leather case, by Finnigans of Bond Street, one of the finest makers of luxury leather cased goods. The glass is in perfect condition, and there is some slight bruising to one silver top. The silver tops screw on to the glass flasks, for a tight seal. Size overall in case-5 inches high by 2.75 inches diameter. Flasks alone-4.5 inches high, 2.4 inches wide and 1.1 inches deep. The case bears the Finnigans retailers marks inside the lid. The case closes tightly without fixing the strap at all. The strap brittle with age, has lost a portion of its length, but could be replaced if desired. An unusual pair of cased spirit flasks in very good condition overall, excellent for hunting, fishing, travelling or outdoor pursuits. Sheffield 1938 solid silver large flask by John Dixon and Sons. Sheffield 1938 English hallmarked solid silver large flask with curved shape and bayonet mount. Made by John Dixon and sons, very good makers. Size 5.75 inches tall, by 4.25 inches wide. In very good condition, with some small bumps, this is a large sized flask, with a very good weight of silver. An excellent gift for the equestrian, fishing or hunting enthusiast, or someone sporty. Early 20th century wonderful large travelling drinks set of flasks and beakers within fitted leather carrying case. Early 20th century fabulous drinks set of 3 curved drinking flasks plus 4 gilt interior beakers within custom fitted leather case. The flasks are large at 13 oz each, holding a total amount of 39 ounces, are tin lined and were made in Germany. Each flask has a different colour enamel threaded top. The colours are meant to designate different beverages, or individual drinkers. They fit perfectly and tightly into the zipped leather case. Sitting nestled and centred within the three flasks, are 4 gilt lined tapering beakers, simple in design, with plain lip trim. The pieces all fit inside an English made hide leather case with long adjustable shoulder strap for ease of carrying, and holding everything required for drinks. Size of flasks-5.5 inches high by 3.25 inches wide, holding 13 oz of liquid each. Size of beakers-1 3/8 inches diameter, by 1 5/8 inches high. Overall size of exterior case-7 inches high by 4 inches diameter. This is a wonderful gift for the person who enjoys outdoor pursuits, fishing, hunting or other sports, and also perfect for picnics. Minute paint speckling and sun fading to case lid, very minor and not detracting. This lovely set is in very good overall condition. A very unusual and practical gift. Search under flask to see our inventory of solid silver flask options if desired. 20th century very decorative J. Smith London large wood fly fishing advertising sign. 20th century very unique and decorative large painted wood J. Smith London fly fishing advertising sign. Striking mainly dark green painted sign with gilt embellishment, depicting 10 well modelled and labelled fishing flies mounted in relief. An unusual wall decoration for a family room, study or library, or would make a great gift for the fly fishing enthusiast. Also a great piece for an appropriate pub, bar or club atmosphere. Size-38 inches wide by 26.5 inches high. Very decorative stylish and attractive, whether one fishes or not! Birmingham 1941 fine quality solid silver flask by GOLDSMITHS AND SILVERSMITHS CO.
Birmingham 1941 fine quality English hallmarked solid silver engine turned flask with curved shape, and bayonet mount. Made by the famous makers of fine quality silver, Goldsmiths and Silversmiths Co. Excellent size to carry in pocket, for indoor and outdoor pursuits. Size-4 inches high by 3.5 inches wide. In very good condition, a wonderful gift for the equestrian, fishing or hunting enthusiast, or someone sporty.